IDP study areas are remarkably diverse in terms of environmental features and threats posed by human activities, therefore offering opportunities for understanding the links between dolphin status and habitat quality in different situations. The Gulf of Ambracia, or Amvrakikos Gulf, is our main study area and the place where the IDP field station is based. The Gulf is a semi-closed basin and one of the most productive coastal areas of Greece. 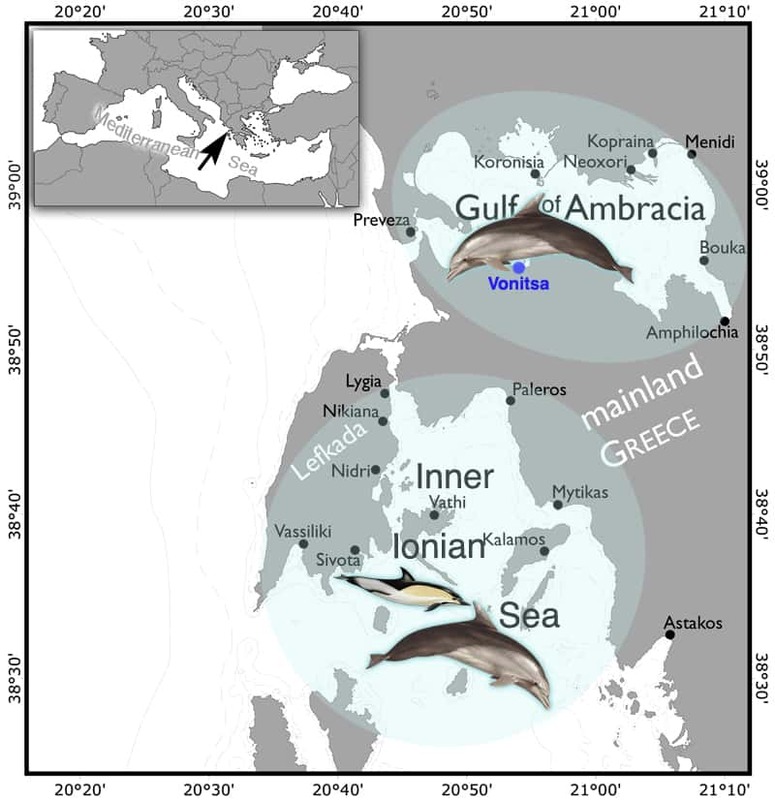 Research conducted by the Tethys Research Institute since 2001 indicates that it hosts one of the highest densities of bottlenose dolphins of the Mediterranean Sea. Based on photo-identification work (49,500 dorsal fin photos filed and 196 individuals identified between 2001 and 2013), these dolphins show high levels of site fidelity within the gulf. Individual movements in and out of the Gulf appear to be limited, probably owing to dramatic differences between the shallow, highly productive, turbid waters of the Gulf and the deep, oligotrophic (low-nutrient), Ionian Sea open waters. The Gulf of Ambracia is reportedly at risk owing to pollutants carried by the rivers Louros and Aracthos and to the wastewaters from the processing of agricultural products by small industries in the broader area. Human activities including agriculture, livestock, grazing, fishing and intensive fish farming have expanded rapidly in recent years, causing degradation of the wetland areas in the northern part of the gulf. Expansion of fish farming and agricultural intensification threaten the food web by increasing pollution levels. In April 2008 the gulf, which is also inhabited by loggerhead sea turtles and has a rich bird fauna including rare species, became a National Park. However, no management action has been taken to address problems related to increasing eutrophication, pollution and other anthropogenic impacts, and no consideration is being given to the Gulf’s abundant marine megafauna. The Inner Ionian Sea Archipelago, where the IDP started in 1991, is just a few kilometres south of the Gulf. Research in this area was initially intended to focus on the ecology and behaviour of common dolphins in a place where these animals were particularly abundant. Instead, the study became a documentation of their sharp decline. Common dolphins in this area declined dramatically from approximately 150 to 15 animals between 1995 and 2007. Since then, a few sightings have been reported in the adjacent waters. Monitoring done in subsequent years (2008-2013) together with numerous reports of opportunistic sightings provided by sailors/boaters collaborating with the IDP showed that a few animals are still present and they likely roam across a much wider area, occasionally moving into their former wonderland. A number of calls were made by several marine conservation organisations to facilitate their recovery, to no avail. Decline of common dolphins in this area has been convincingly linked to overfishing and specific fisheries management solutions have been advocated. Bottlenose dolphins are found in relatively small numbers, but they seem to have stable trends. Of about 120 individuals photo-identified in this area, about one quarter have shown high levels of site fidelity, while the others are transients. However, even individuals with high levels of ‘residency’ were found to make long-distance movements. Groups of striped dolphins (Stenella coeruleoalba) occasionally enter these waters. A few occasional sightings of single individuals of Mediterranean monk seal (Monachus monachus) have also occurred.